With each and every monthly project that we do here, you will essentially be receiving TWO tutorials. There’s ONE tutorial that Lisa presents in her book. There’s another tutorial that I will present as a spin off of her project. You are welcome to do either one. 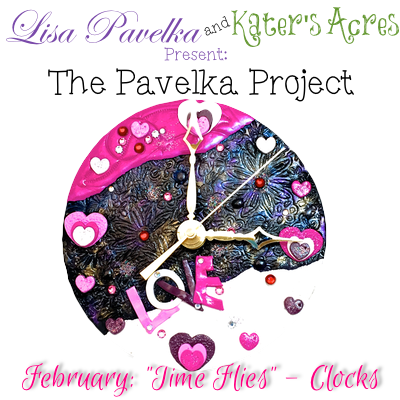 This month, Lisa offers TWO different takes on a clock based project, see details below. Your choice of polymer clay – at maximum 3 total blocks for the project. Pre-plan your design, colors, & more so you now about how much clay you will need. My background alone took almost a whole block of black clay (plus scrap underneath). *Tiny-medium sized beads and/or gemstones for embellishments. Lisa demonstrates two fantastic projects in her books. The first project uses a traditional watch that you can make a millefiori background for. The second uses a wooden platform to create the clock. Since both of her projects use mixed media materials, I chose for a third option to make a clock all out of clay, except for the clockwork assembly. (See the notes above on where to find each project). Fully condition about 2-4 ounces of SCRAP polymer clay depending on the expected finished size of your clock. I chose to use a 4″ round cutter to make my clock and needed about 3.5 ounces of polymer clay. Roll a sheet of clay on the 2nd largest setting of your pasta machine. Using a ceramic tile as your surface, gently ROLL the sheet of clay onto the tile with an acrylic brayer, without trapping any air underneath. Place your large cutter or template on TOP of the clay. Cut the shape you wish to use as your clock. Remove the excess clay before removing your cutter or template. Gently peel the clay away from the cutter leaving behind only the shape you will to keep. NOTE: You can make a square clock, heart shaped clock, or any other shaped clock you choose. I chose a circle. Choose a color of clay for the background. Roll your clay through the 3rd largest setting on your pasta machine. NOTE: We want this clay to be thick enough that it is substantial since we are not using a base. Do you be shy about the thickness, it just means you may have to cook it longer. Place your sheet of clay on a sheet of waxed paper or label paper backing. Choose a texture stamp and gently ROLL it over the surface of your clay using an acrylic brayer. NOTE: You want this texture to be deep, so don’t hesitate to redo your texture if it doesn’t take the first time. When you are satisfied with your texture, cut a second round from this textured sheet. Gently remove the texture shape from the backing. Place this second shape directly over the first, try your hardest to be exact here so that cleanup is easier. I used torn clay sheets on the top & bottom of my clock. I like the look that it leaves behind, like torn paper. I wanted a “scrapbook cutout” kind of a look, so that’s what I went with using Kemper heart cutters in three different sizes. I used stamps to texture the new pieces on the edge of my clock (they didn’t photograph well in the end, sorry). When adding your hold for the clock hand assemble, be sure that it goes EXACTLY in the middle. Otherwise your clock will look wonky. (PS: Mine is in the center, but the picture was at an angle). Set your clock apart by adding some details. For me this meant Swarovski hot fix crystals, mica powders, and even some drops of “dew” on the clock itself. Think outside the box by following your instinct. Does something look off? Fix it now before it’s permanent. Have you overdone something? Try to remove it before baking to correct the error. Have you not done enough? Follow your texturization and embellish the obvious parts: centers of flowers, “dots” in the design, etc. Remember that making a mistake is just another great opportunity to cover it with something fun! Your baking time will vary depending on thickness of clay & the brand that you used. I baked my clock for 90 minutes at 275 degree Fahrenheit. ***If you desire a border on your clock, bake your clock for just 30 minutes and let cool. Then remove from oven, add a border of your choice, and bake again for at least 60-75 minutes longer. When your clock has baked & cooled completely, assemble your clock hands as directed on your individual package instructions. Each clock hands assembly might be different, so be sure to read your instructions first. In The Complete Book of Polymer Clay there is a picture of a watch embedded in polymer clay and used as a pendant. I would rather do a watch than a clock. How do you get the watch into the clay. I would think it had to just sit in a frame or you would never be able to change the battery. I also can’t imagine baking a watch. It would be cool to have several interchangeable frames. Hi Roberta – I’m not sure about this. We’ll have to ask Lisa to chime in and help out. I had family issues that made me miss January’s deadline so I’m excited about this one, Katie! I admit, looking at the project in Lisa’s book sort of intimidated me. lol I’m not a mechanically inclined person by far! But you have definitely simplified this one and I can’t wait to try my hand.